Winter is here and many of us are shivering under layers of clothes. But once you peel off your coat, scarf, hat and gloves, some wintery jewelry might just take the edge off the brrr. 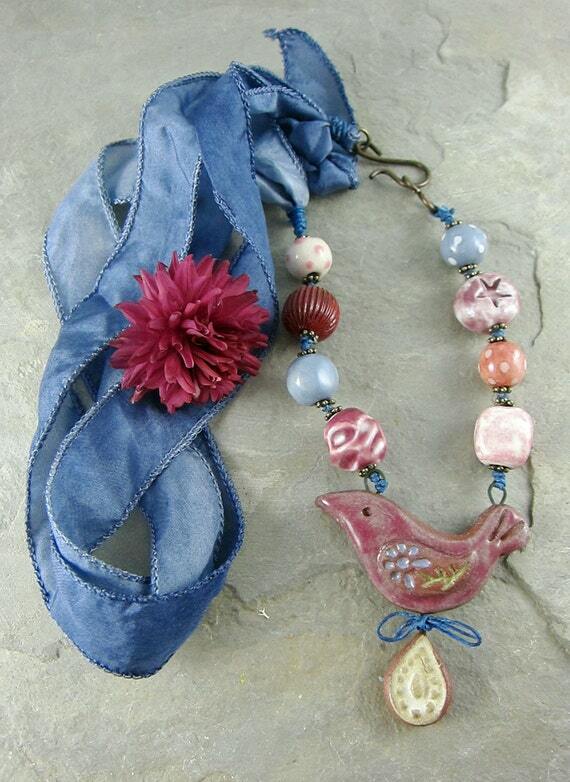 This rustic necklace features a ceramic pendant by my friend Diana Ptaszynski, a handmade clasp that echoes the angles of the snowflake and gorgeous deep blue batik ribbon. Nobody will accuse you of being boring when you wear this unique artisan necklace! Perhaps you’d like something a little more subtle; something you can just slip over your head with a simple tee shirt or sweater. 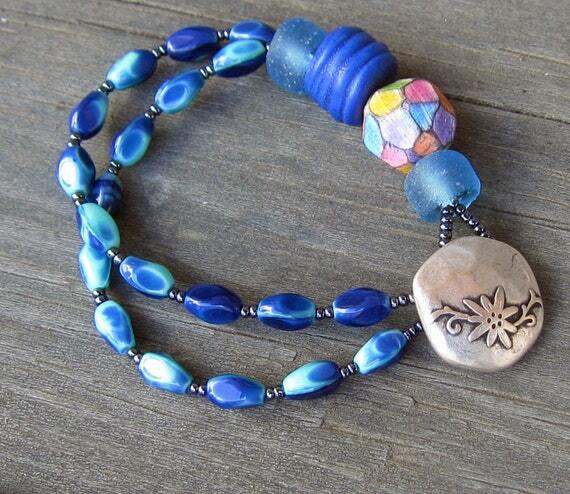 This necklace features my own handmade ceramic snowflake and a raku bead by Xaz Beads. I also have a couple of winter themed earrings in my shop. These earrings have ceramic snowflakes by Bo Hulley and lampwork glass by my friends at Paradise Bead. All the wire is Sterling silver. These are so pretty! These are my favorite of the four shown here. The lampwork beads by Sue Beads shimmer with a silvery iridescence and the artisan sterling silver snowflakes are exquisitely detailed. These will make your ears happy! What do you like best about winter? I like walking in crunchy sounding snow. How about you? 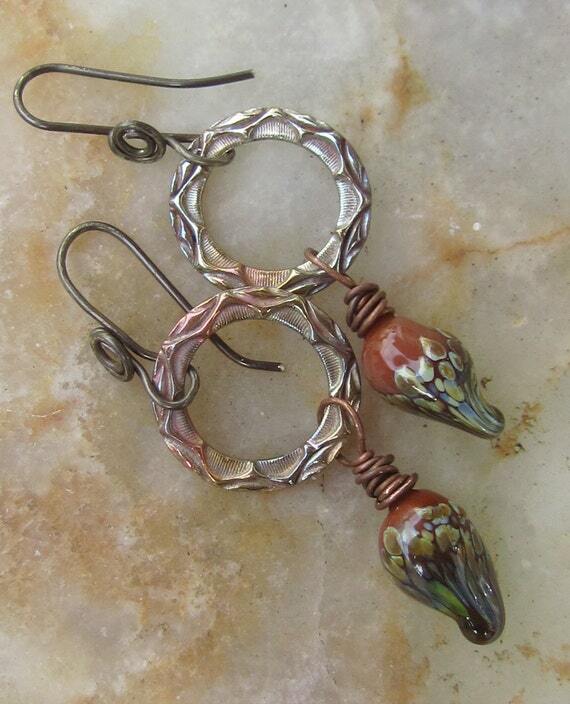 I am so pleased to announce that my jewelry is now available at Gallery Boom in Tumwater, WA. This is my display, near the front window (see picture above). 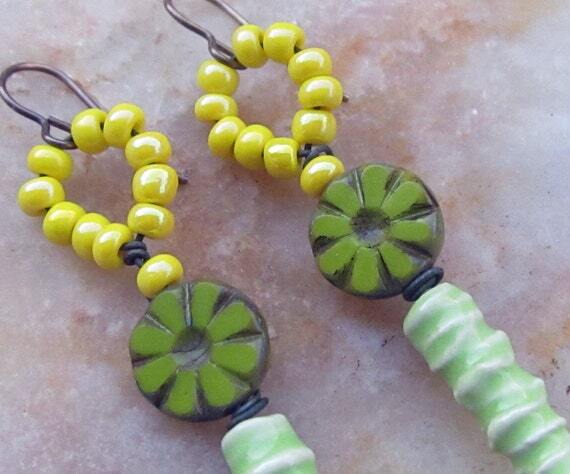 The earrings, bracelets and necklaces all have handmade ceramic components, both my own ceramic beads and pendants, as well as the work of other ceramic bead artists. 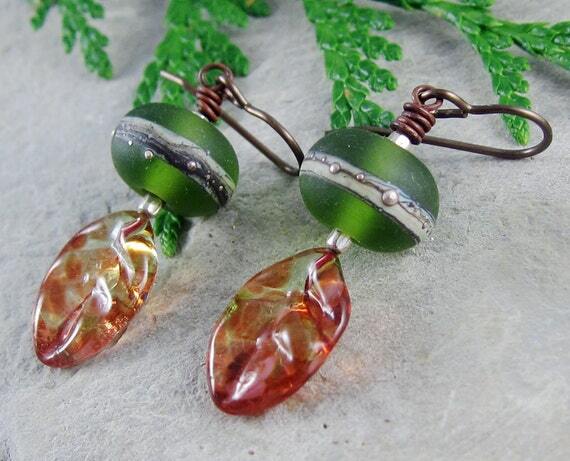 You’ll also find lampwork glass and various textile accents in my work, as well. The photo below shows my earring display. There was a strong backlight coming through the window, so it was hard to photograph with accurate colors. I added some tacks to my usual wooden box displays, so I could hang up some of my bracelets. A few days ago I made the Christmas bracelet you see in the center of the photo. It was fun to make and it’s fun to wear! My jewelry is the best company at Gallery Boom! I want to share a small selection of all the artwork you can find there. Fun, stuffed creatures, made with upcycled materials. Swoon! My favorite colors are featured in this knitted scarf. And this is just a partial selection of what is available! If you are local, I hope you’ll come check us out. Regarding that….Gallery Boom is on the far side of the Fred Meyer parking lot, in Tumwater. It is between the building that houses Starbucks and the building that includes Panda Express. Gallery Boom is in the bright blue house, with the whimsical paintings by owner Christine Malek. The gallery is a great place to wrap up your Christmas shopping ,while supporting local artists. See you there! p.s. I’ll be taking a shift this Sat. from 11:00-3:00, if you want to stop in and say “Hi”. 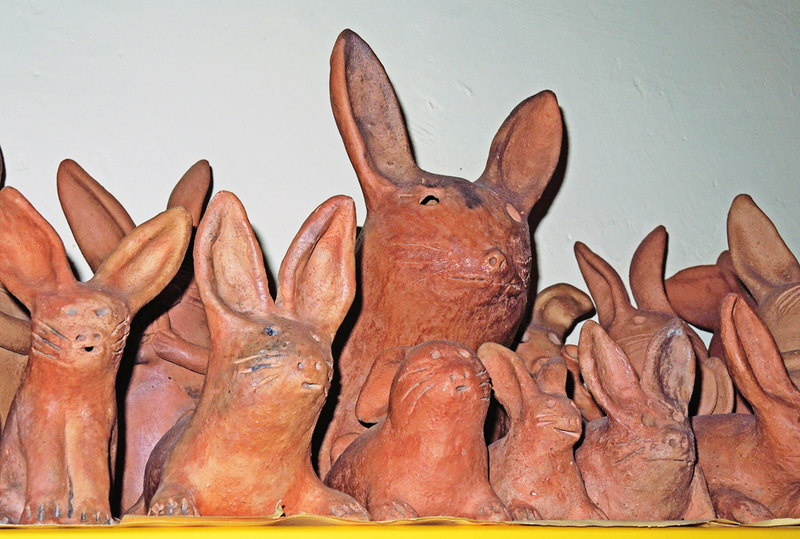 The Art Jewelry Elements Theme Challenge for March is Hares and Bunnies. 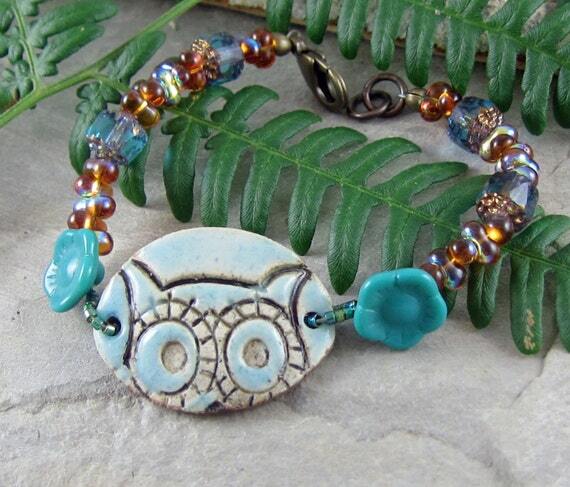 The challenge was simple: Make a rabbit or hare bead or piece of jewelry and share it on March 31st. I don’t have any rabbit or hare beads with me here in Mexico, so I couldn’t really participate in terms of making something new. So instead I’m going to share a rabbit necklace that is currently available in my shop, as well as some rabbit jewelry that I have designed and sold in the past. First off is this delightful “Bunny Love” necklace. I was lucky enough to snare this double bunny pendant from Nancy Adams of Round Rabbit. Her ceramic work sells fast, so I was pleased to have been at the right place at the right time to grab this pendant. The Bunny Love necklace is in my shop, which, by the way, is brand spankin’ new! I’ve been busy this past month setting up my own, stand-alone website. Some things will remain in my Etsy shop, but my complete line of jewelry and ceramic components will only be available on my website. The web address is easy to remember. Its just my name and dot com. .www.LindaLandig.com I will be back in the States soon and all orders placed now will ship on April 7th, via USPS. I love bunnies, so I thought I’d share a couple of my previously sold designs as well. 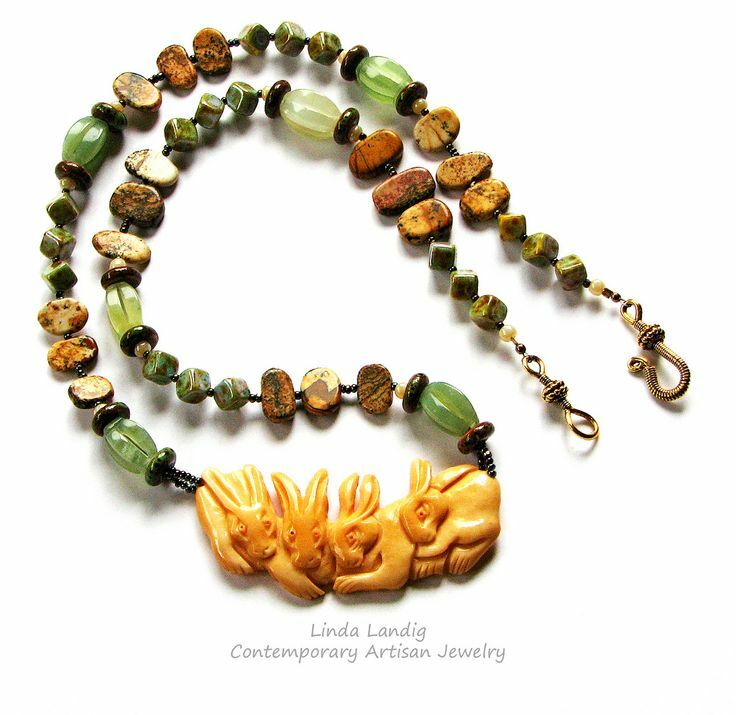 This necklace features one of Jenny Davies-Reazor’s wonderful ceramic hare pendants. I made it for display in her both for Bead Fest 2013. This necklace dates way back to 2010, but it is still one of my favorites. 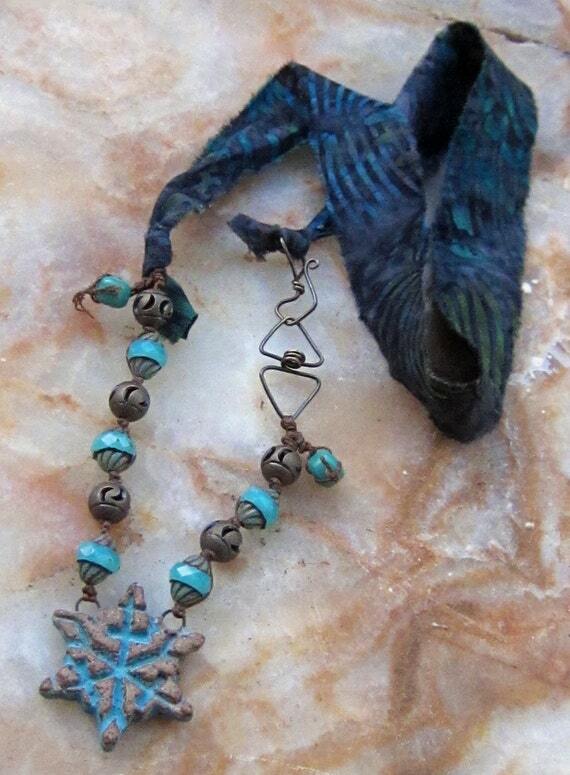 I love the carved pendant! I’m really looking forward to seeing all the rabbit and hare designs. Here are all the links. Let’s get hopping! The first month of 2015 has gone by in a rush. 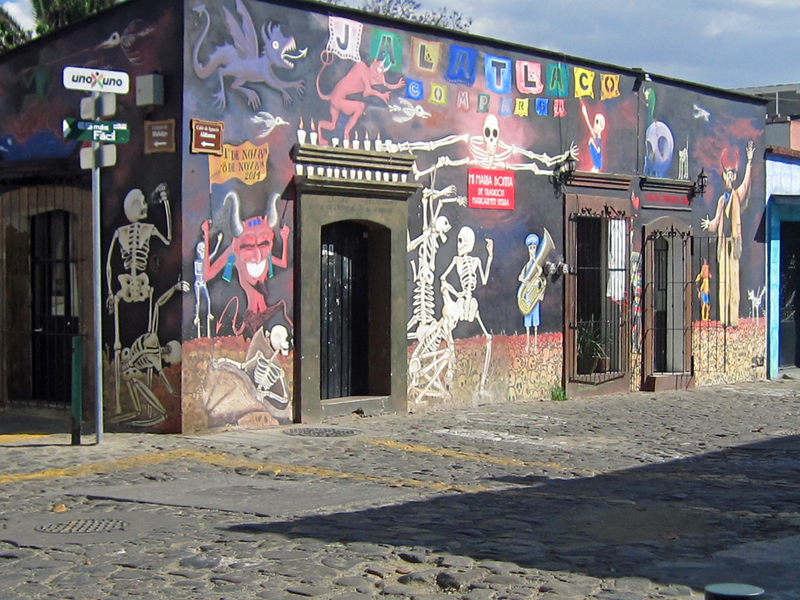 Our big adventure is that we are living in Oaxaca, Mexico through the end of March. We celebrated the New Year in Oaxaca by dancing to an awesome marimba band and watching fireworks. Of course I brought beads with me here and I’ve been busy designing new pieces. 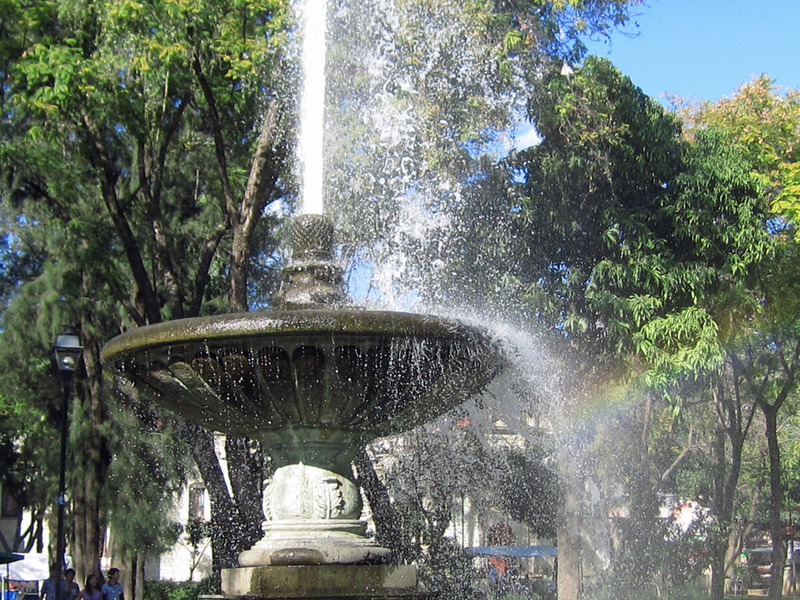 Oaxaca has been good for my creative mojo. I’ve also been blogging like a crazy woman. Thank You Sale – 20% Off! 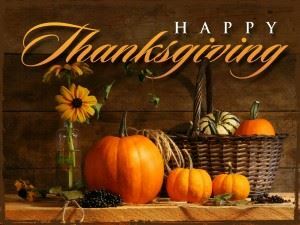 Happy Thanksgiving to all my readers. 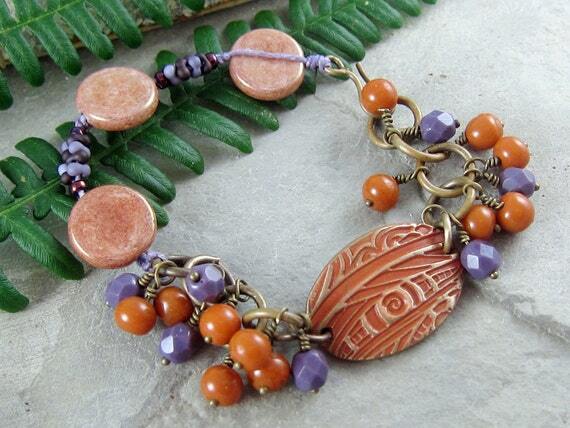 I am thankful for our bead community on my blogs, on Facebook and here in my own neighborhood. I’m having a 20% off sale on everything in my jewelry and component shop from now through the end of the day on Monday December 1st. 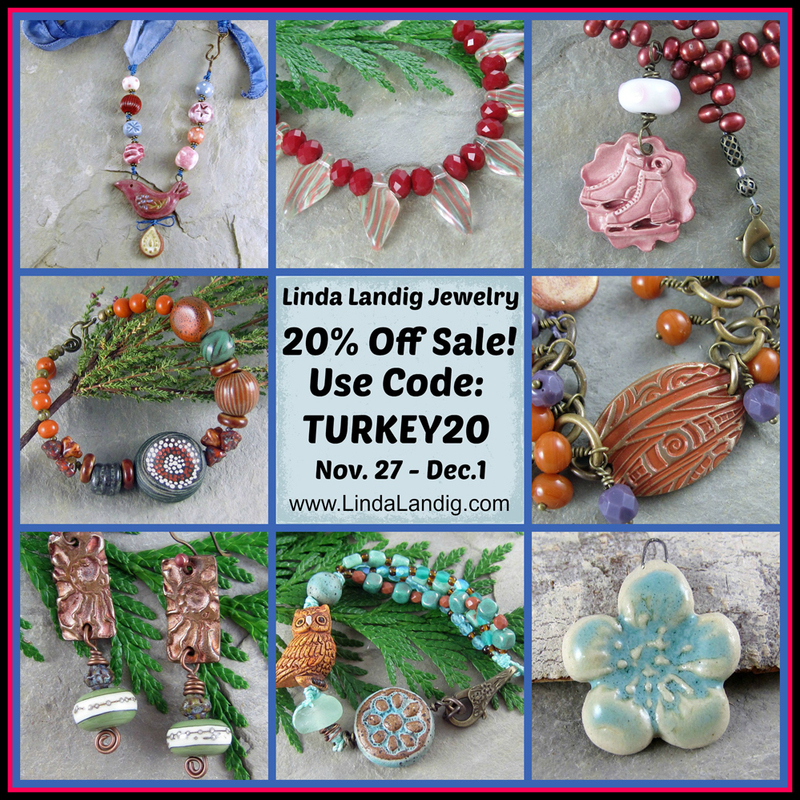 Just go to Linda Landig Jewelry and use either the coupon code TURKEY20 or TURKEY14 at check out and the 20% will be taken off your purchase. Easy-peasy! 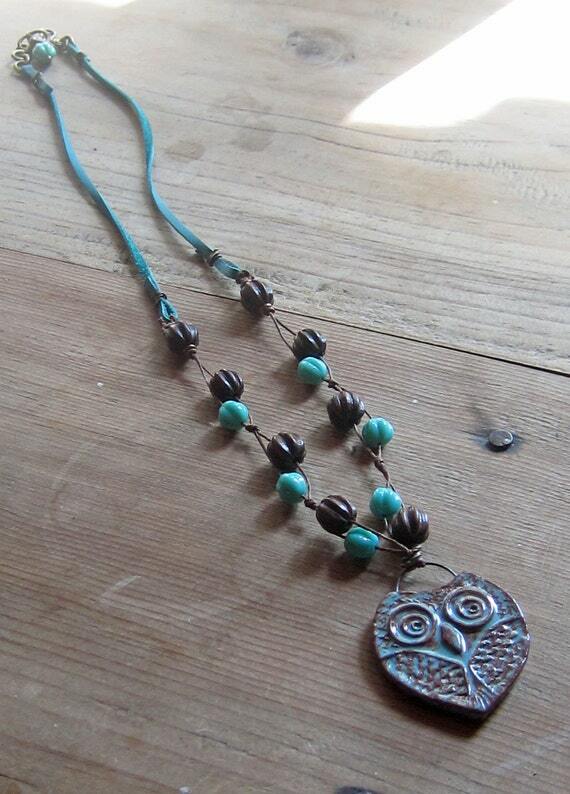 You’ll find necklaces, earrings, bracelets and ceramic pendants in a range of colors and prices. 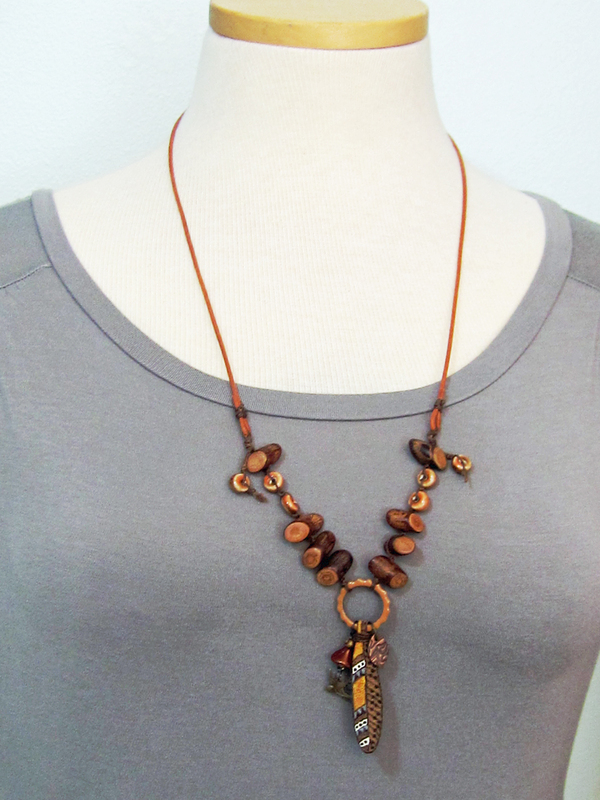 Perfect for holiday gift giving or for accessorizing your holiday outfits. This year I am seriously trying to avoid the malls and shop locally or online. I feel so much calmer when I do so. I hate being frazzled in the days leading up to the holidays. Last year was awful in that way and I’ve resolved to approach things differently this year. I have a show this Saturday. 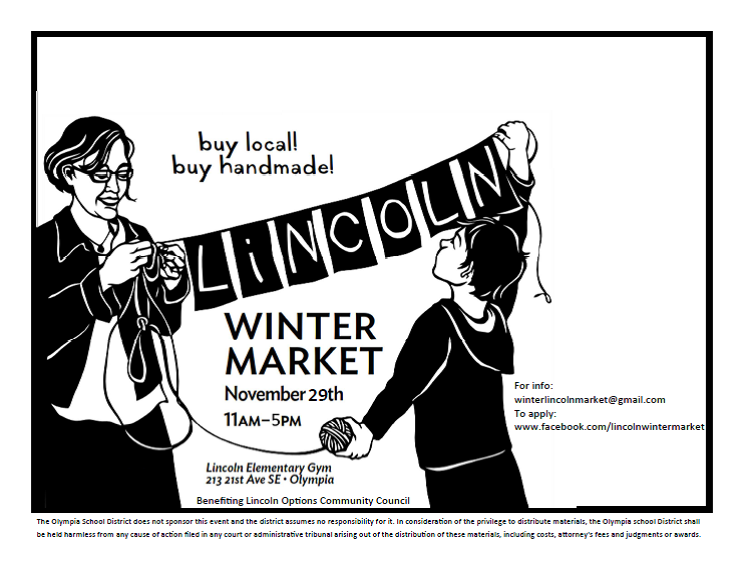 If you are local, I hope you’ll come visit at the Lincoln School Winter Market! I plan to do much of my shopping there and then wrap up the rest online. In preparation for the upcoming holidays, my local Etsy Team has challenged its members to reach 100 listings on Etsy by today. I took up the challenge and am proud to say that I have reached the goal! Here are a few of the new items you’ll find in my shop. By the way, did you notice my new blog template? Clean and modern. What do you think? The talented Rebekah Payne of Tree Wings Studio is this month’s hostess for the AJE Component of the Month Challenge. 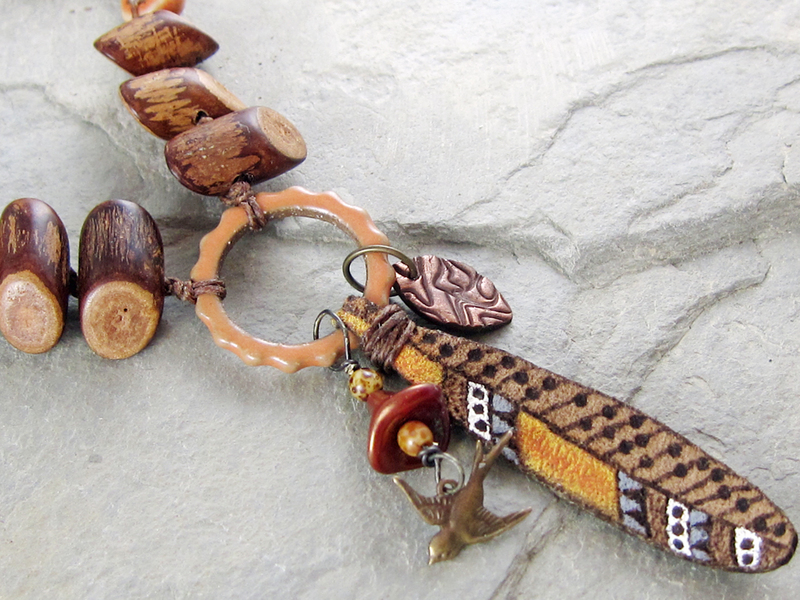 Rebekah is well known for her delightful polymer clay jewelry components, but for the last year or so, she has been working with leather, as well. Her colorful leather feathers are really inspiring. They come in 2 sizes: large ones for pendants or smaller ones for earring pairs. I requested the smaller earring size and received the pair in the the upper left of this photo. Even though these are the smaller sized feathers, they are still close to three inches long, so I decided to use mine as a pendant. I folded the top of the feather around one of Karen Totten’s ceramic gear links and I secured it with Irish waxed linen cord. 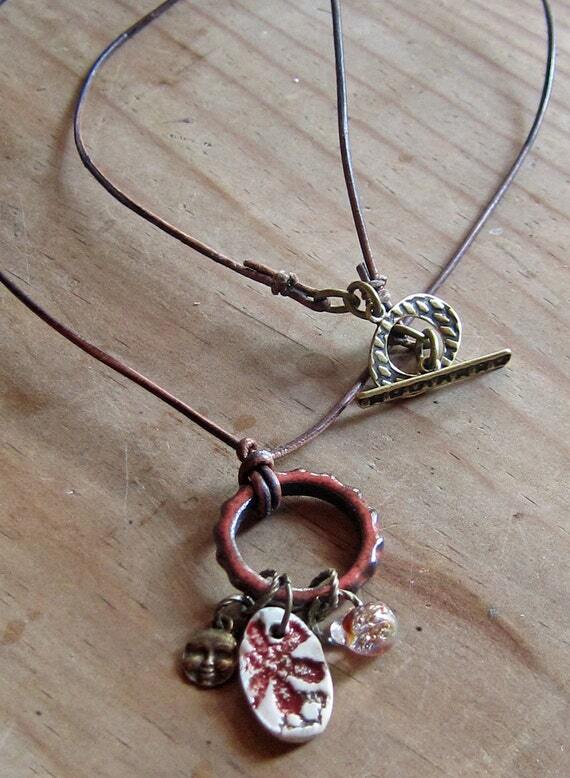 I dangled a copper charm on one side and a copper colored flower with an antiqued brass bird on the other. 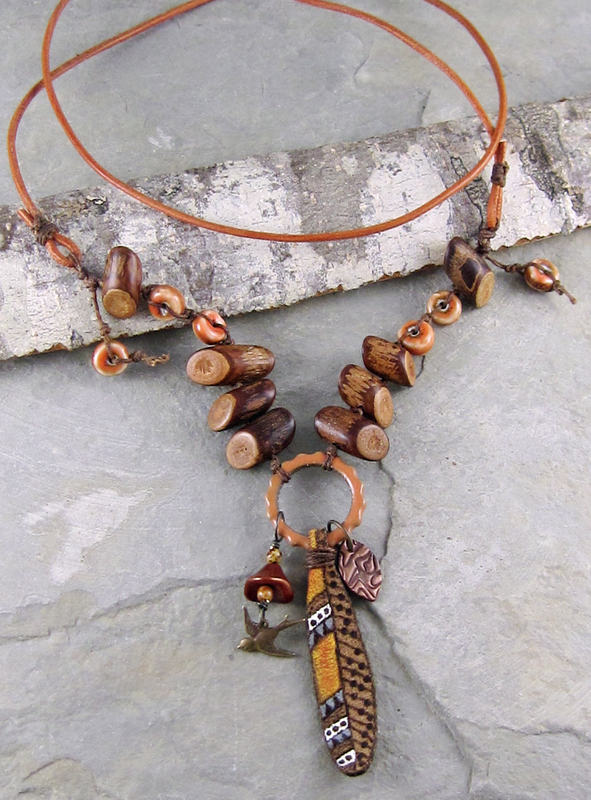 The beaded part of the necklace includes lightweight wood beads and Greek ceramic discs. I attached these to a long length of leather, that simply slips over the head, without needing a clasp. I really like the necklace, but I have 2 questions where I’d appreciate some feedback from readers. 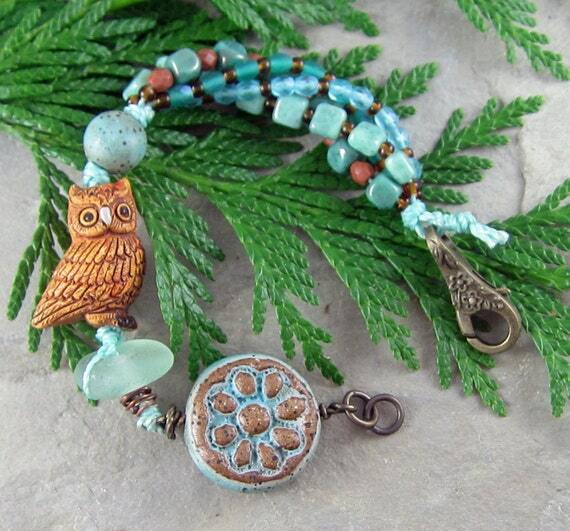 Do you like the charms on either side of the feather, or would it look better without them? What do you think about the length of the necklace? Do you think it should be shorter, or not? Listed below are links to all the people who participated in this month’s challenge. 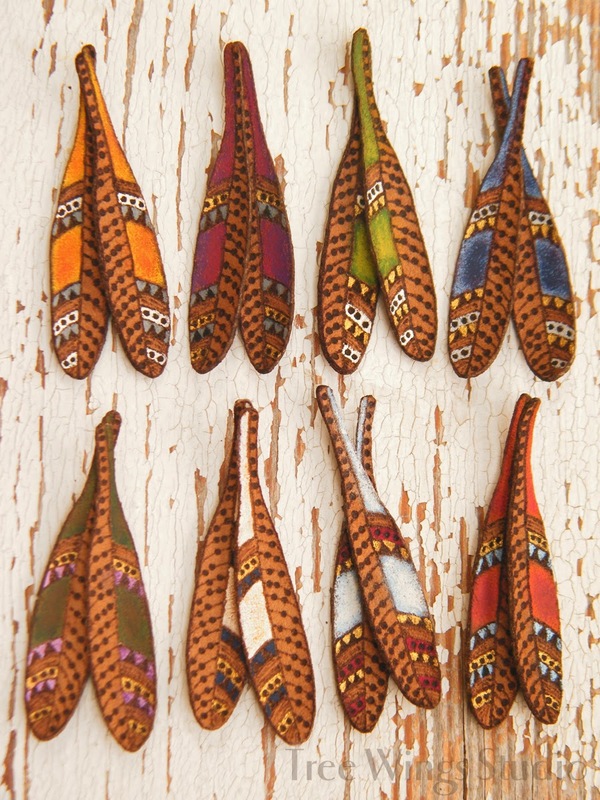 Check out their blogs to see all the unique designs made with Rebekah’s leather feathers! 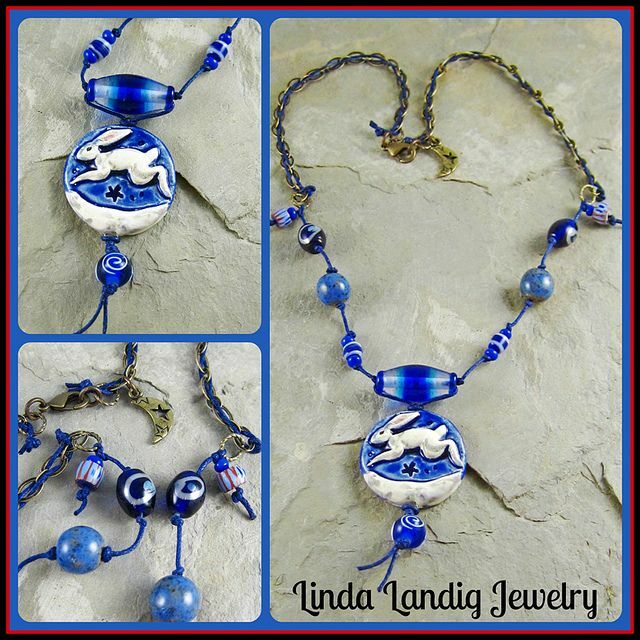 Linda Landig <— You are here!